Up at 5 AM. Took care of the menagerie and began the transformation at 5:35. I took my time doing my makeup (slow, but steady), so it took a little longer getting ready. Out the door at 7:05 and I arrived at work at 7:40. Although I only mentioned that I would be a woman at work to my boss, no one is surprised and expected me to do it. Three people noticed that I am wearing a new wig! The receptionist just called me "Staci," which is the name I used before switching to Stana. She also asked me how I tied my scarf and I gladly showed her. There is a bit of a lull here, so here is another photo (sans glasses and cape) taken by the guy who sits in a cube adjacent to me. Instead of an iPhone, he used a Canon digital SLR camera. I just attended a "gemba" (reps from various departments stand in a circle and update the group about the status of a project). The Director of Engineering ran this gemba and called me "Caitlyn." He is always impressed with my "costume" and was impressed again this year. A few other people did wear costumes today. A number of women complimented me on my outfit and they love my shoes (I do, too)! They are also amazed on how well I navigate in them... just like a woman. I bought these shoes from Nine West two years ago, but I never had the opportunity to wear them until now because I did not have an outfit that went with them. So far, they have been very comfortable despite their 4-inch heel. Going to Dress Barn in a little while. The sales associates wanted to see how the dress they sold me on Monday looks on me today. I went to Dress Barn and the sales associates who sold me the dress on Monday were not in the store; they work later in the day today. Not to waste a Dress Barn visit, I browsed the racks and took a half dozen items to the dressing room. Some things looked and fit better than others. 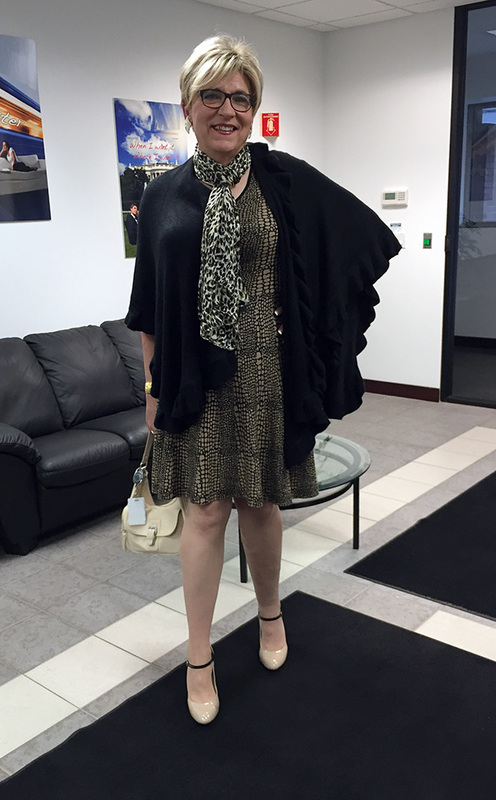 One dress fit perfectly and looked great: a simple figure-hugging black sheath dress with a gold front zipper that makes the dress. I bought the dress and returned to work. As I got ready to leave Dress Barn, my feet started complaining loudly and when I got to my car, I switched to my black medium height wedges. Another lull, so it is time for another photo. My boss' boss took this one on her iPhone as I stood in her office doorway. It is very quiet here. Friday afternoon and things are winding down. I am very tired. I went to bed late watching the Patriots, got up early to femulate and did not sleep that well in-between because I was excited about today. One of my biggest fans here just stopped in to ask me how it is going. He goes out of his way to use the proper pronouns when I am a woman and he once said that I missed my calling and should have been a professional female impersonator. This will probably be my last live post for awhile because I am leaving work and going to the mall to shop for a new evening gown. My next post will probably be from home this evening. I was successful at Macy's at the mall. I bought a Connected sequin-lace cowl-neck sheath in purple. The photo on the website does not do the dress justice; the sequin is not apparent in the photo, but it makes the dress in person. My feet had recovered by the time I arrived at the mall and I switched back to heels for my mall tour. I am going to bed early tonight. I am exhausted! This so exciting. You look really nice, setting the bar pretty high for the other women. I can see how hard it is for you not to follow your heart towards going full time. Hands down, I was the best dressed woman in my office on Friday and you are correct, it was very difficult not doing it again today. Wow, you look great and fit the business world well. Have the other women in the office risen to your challenge? The idea of an ongoing live blog is really fun. This is the second time I have checked today and will check at least twice more to keep up to date. In general, the other women here dress business casual all the time unless there is something important going on. If I showed up for work everyday the way I dressed on Friday, they might feel challenged and do something about it, but until then, business casual rules. Absolutely beautiful girl! Lovely outfit. Want the shoes! Very classy, they look comfortable even 4 inches off the ground. The Canon picture is the best I’ve seen in a long time. A happy face, the smile natural just perfect! This is you shining through! I know its difficult but once a year is just not enough Stana. No, once a year is not enough, Abigale. Dressing in boy mode for work this morning is the real drag. That is a great looking outfit indeed. I live the shoes as well. LOVELY! You look gorgeous (as always) in today's ensemble. I love the dress. I have a couple that are similar. When I bought the dress, I was not sure it would work, but it did and I was very happy with my appearance on Friday, Sheila. The live blog is fun. You look great. 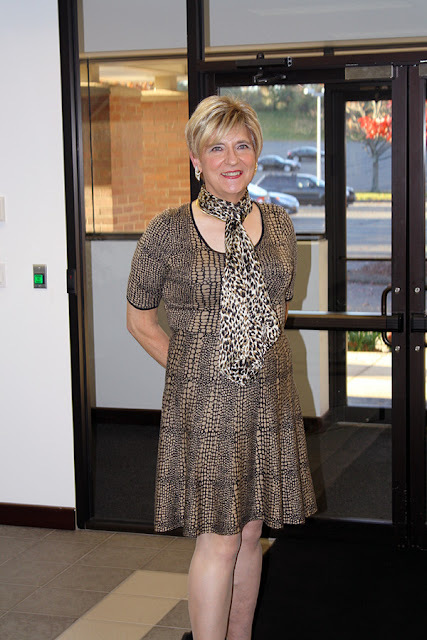 The dress is awesome and it works great with the shoes. Best of all it looks like you are having a lot of fun and fun is one of the best things about being a femulator. Thank you for the "you look great" and I felt great, too, Pat! Really enjoying your blog and following your adventures at work today. You look totally stunning. We don't have this tradition in the UK, but I'll be out dressed tomorrow when our cinema group screen a fab vampire film from Iran! 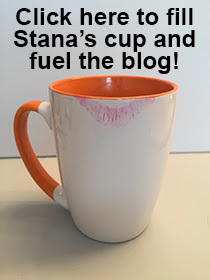 Really have enjoyed the blog today too Stana. Your outfit looks office perfect, I am sure you have challenged the regulars to improve their dress along the way. Hope the rest of your day is just as much fun! Your biggest fan doesn't know you at all. "Professional female impersonator" is a job only guys can do. You look great. Always enjoy the read. You really do raise the bar for the "Classy babe" look. Happy Halloween! Thank You for the live blogging! Very enjoyable! I especially liked the very positive reception by two male co-workers. With all the recent transgender news in the media over the last year or so (Caitlyn Jenner, Jazz Jennings, etc.) and your now annual gorgeous and spot-on femulations at work, I'm guessing you are "out" at work as transgender with all your co-workers (even if you have not announced it yourself). I realize you are lovingly following your wife's wishes to not go to work regularly as a woman. I respect your true love for your wife ... very admirable. Maybe someday, she will change her mind (as women are wont to do), and Stana will be the "new girl" at work daily. I hope your thoughts become true, Sheila!